Fish Creek Mountain trail leads to a former lookout site and to High Lake. 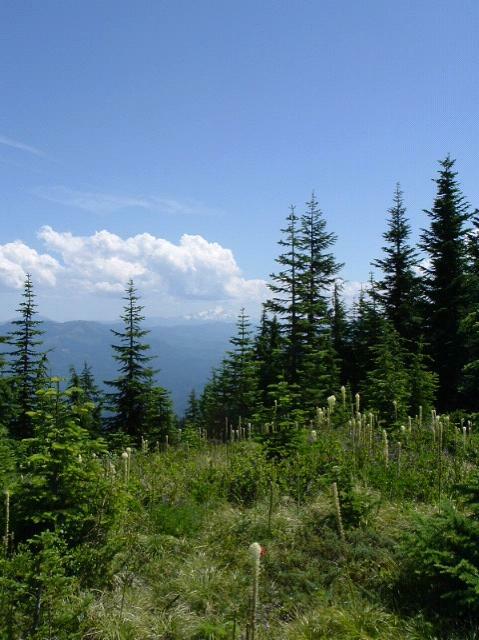 The double summit is clearly visible for miles and provides a great high country experience. One should be prepared for a long ascent. It is a 2000′ climb. Bring plenty of water. 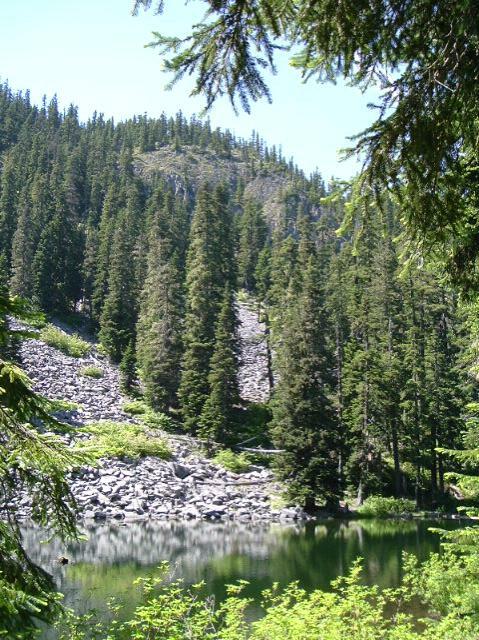 Trail offers a variety of views, flowers, berries, rock features, and dramatic ridge walking in addition to a summit and a delightful hidden lake which is reason alone to visit this trail. Trail is currently being restored. Consequently there are a couple of rough spots. The upper trail head was isolated by road closures after the floods of 1996. The access is now from an older trail head abandoned in 1969.
just before another left which has been closed off by piles of rock. This was the continuation of 4620 towards Thunder Mt lost by land slides. The trail head is at this former junction of 4620 and 4622. Follow a cat road parallel to the abandoned road for a slight way and trail departs to the right. Follow up a couple of switchbacks and through a tumble of large blow down. Climb uphill and slightly left and follow a clearing through the rhododendrons about 200′ to resume the original trail. There may be flagging marking the way. The passage though here is becoming clearer as use increases. Continue up the hill into a stand of 40 year old plantation trees. Climb up a steep set of short switchbacks in thimble berries (yum) to the decommissioned road. There may be some flagging marking the spot where you come out on to this road. Make sure you are confident you will be able to find your way back the way you have come. This access trail is improved a little each year. Once on the former road, proceed north about a third of a mile to a fork in the road. The trail head lost to the road closures is at the junction rising up the ridge between the two roads – a steep pebbly ramp. From here onwards the trail is easy to follow. The High Lake junction is in a saddle between the two summits 2.35 miles from the trailhead. It is a half mile down to the lake. A descent of a little over 300′ in elevation. The trail to the summit is seriously brushed in at places. Down to High Lake the route is also brushy in places. High Lake has two nice camp sites. Be careful over the large log on the way to the east shore camp. We used to walk it for years, but the bark has recently begun to slip away. Mileage to High Lake: 3.75 miles. Mileage to the summit: 3.1 miles. Total mileage round trip to both the summit and the lake: 8.1 miles. Trail shows on older topo maps and is in some older guide books. All the roads shown on the west side of the divide are decommissioned, ie., ripped up. The dotted line jeep road has slipped down the hill and is gone.